Daire McDaid struck twice to fire Kilmacrennan Celtic to the top of the Premier Division as they got the better of Castlefinn Celtic in Sunday’s top of the table clash at Park View. The defeat, Castlefinn’s first at home in the league this season, is a blow to their title aspirations and while there is still some way to go, this could well go down as a pivotal weekend in race for league honours. Kilmacrennan showed in this game that even without a couple of key players, they have quality and experience within their ranks. And in Daire and Caolan McDaid they have a front pairing that’s up there with the best in this division. They were a constant threat throughout and while Caolan’s day ended prematurely when he picked up a second yellow card close to the end, Daire made up for that blemish with two well taken goals. His opener came on 20 minutes. He took a corner short to the feet of James Doherty and when taking the return pass, he shot first time off his lethal left foot and drove his effort into the far top corner. Kilmacrennan had been the better side early on but Castlefinn’s response to that set-back was good with Corrie Lee Bogan, Gary mcNulty and Ronan Tourish all catching the eye. Johnny Doherty fired a shot from long range and Peter Bryson also had a chance before Bogan saw a deflected shot saved brilliantly by Kilmacrennan’s new goalkeeper James Gallagher. The former Finn Harps player dived to his right to push away Bogan’s effort which looked destined for the top corner. But Gallagher was eventually beaten on 42 minutes when defender Barry Tourish’s rasping effort from long range came crashing down off the crossbar where JP Malley was perfectly placed to turn the loose ball home. The game was delicately poised going into the second half but the visitors were the better side after the turnaround and they got themselves back into the lead on 58 when Daire McDaid found space in front of goal to turn Gary Whoriskey’s corner home. After that, they had chance to score a third with Aidan Sweeney and Daire McDaid both seeing efforts saved by home goalkeeper Chris O’Donnell. The sending off of Caolan McDaid on 77 minutes meant Castlefinn, with the extra man, saw a lot more possession from then to the finish but despite their best efforts, they couldn’t find an equaliser. Kilmacrennan, for whom James Doherty and Declan O’Donnell were excellent in the centre of defence, deservedly held out to take the points. 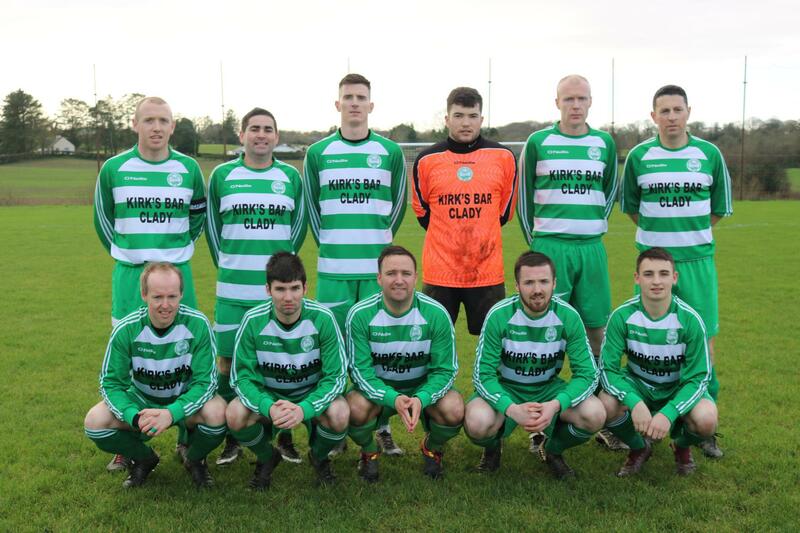 Castlefinn Celtic: Chris O’Donnell, Gary McNulty (Keith Nelis 92), Barry Tourish, Michael Dunnion, Peter Bryson, Johnny Doherty, Corrie Lee Bogan, Raymond Foy, JP Malley (Shane Gallagher 47), Ronan Tourish, Emmett White (Marty Owens 64). Kilmacrennan Celtic: James Gallagher, Seamie Friel, John Sandilands, James Doherty, Declan O’Donnell, Mark Friel, Aidan Sweeney (Daniel McLaughlin 72), Gary Whoriskey, Caolan McDaid, Daire McDaid, Enda McCormick.